Formats included are .ma, .mb, .obj, .fbx, and .unitypackage. The unity package includes a demo scene and prefab. Custom Mesh Colliders have been added in the unitypackage. Raw files included can be used for Virtual Reality (VR), Augmented Reality (AR), games and other real-time apps that use PBR materials. Renders for presentation were made in Marmoset Toolbag. 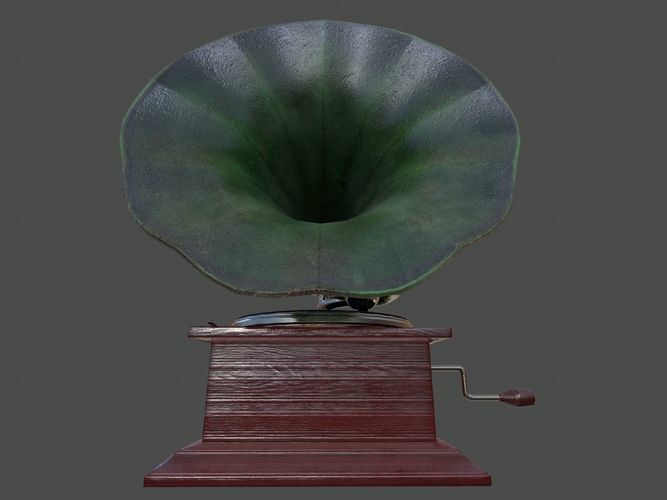 This Phonograph/Gramophone mesh has separate parts for the Horn, ToneArm, Turntable, WindingKey, and Base. Each part has pivot located at the center of rotation for that object for easy animation. All textures use lossless .tga or .png file formats to keep quality. Texture resolution - 2048: AlbedoM, Metal/Gloss, Roughness, Normal, AO, and MatID.